Image caption Dr Tutu says morality and leadership are "indivisible". Archbishop Desmond Tutu has pulled out of an event because he refuses to share a platform with Tony Blair. The veteran peace campaigner said Mr Blair's support for the Iraq war was "morally indefensible" and it would be "inappropriate" for him to appear alongside him. The pair were due to take part in a one-day leadership summit in Johannesburg, South Africa on Thursday. Mr Blair's office said he was "sorry" the archbishop had decided to pull out. Dr Tutu, who was awarded the Nobel Peace Prize in 1984 in recognition of his campaign against apartheid, and Mr Blair were due to appear at the Discovery Invest Leadership Summit. Other speakers include chess grandmaster and opposition Russian politician Garry Kasparov and former Tesco chief executive Sir Terry Leahy. 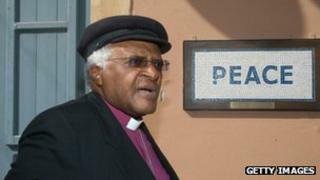 In a statement, Dr Tutu's Office said: "Ultimately, the archbishop is of the view that Mr Blair's decision to support the United States' military invasion of Iraq, on the basis of unproven allegations of the existence in Iraq of weapons of mass destruction, was morally indefensible. "The Discovery Invest Leadership Summit has leadership as its theme. Morality and leadership are indivisible. "In this context, it would be inappropriate and untenable for the archbishop to share a platform with Mr Blair." Tony Blair's office responded by saying he was sorry that Dr Tutu had pulled out, adding that the former prime minister and the former Archbishop of Cape Town "were never actually sharing a platform" together. The statement continued: "As far as Iraq is concerned they have always disagreed about removing Saddam by force - such disagreement is part of a healthy democracy." "As for the morality of that decision we have recently had both the memorial of the Halabja massacre where thousands of people were murdered in one day by Saddam's use of chemical weapons; and that of the Iran-Iraq war where casualties numbered up to a million including many killed by chemical weapons. "So these decisions are never easy morally or politically." Dr Tutu's withdrawal comes as the local Muslim party Al Jama-ah is reported to be planning a protest against Mr Blair's participation at the event because of his support for the Iraq war.